HodlBot is a very cool piece of software which operates like an index fund. You pay HodlBot money and HodlBot will allocate a portfolio of cryptocurrency purchases for you. 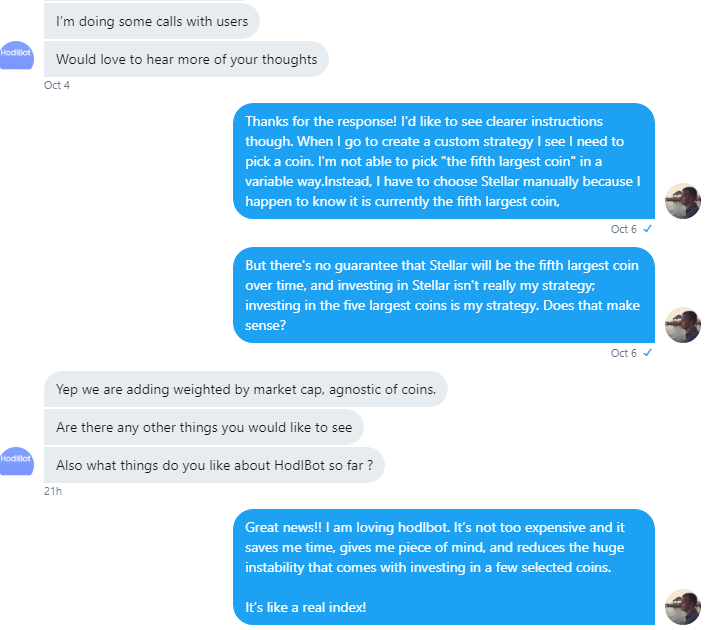 HodlBot supports custom portfolio allocations by coin. You can tell HodlBot to allocate 25% of your crypto purchase into ethereum, 50% into bitcoin, and another 25% into eos, for example. HodlBot’s maker also has several flagship indices including HODL 10, HODL 20, and HODL 30. These indices invest in a basket of the largest cryptocurrencies by market cap. These are basically crypto equivalents of the S&P. Here’s a related but distinct feature I would like: Instead of saying I want 25% of my portfolio allocated to ethereum, I want to be able to say I would like 25% of my portfolio allocated to the second largest coin by market cap. Today, those statements are equivalent, but over time that should be reasonably expected to change. As an investor, the whole reason I prefer indexed investing is because I’m not a great predictor of which asset will be at what position when. So I don’t want to pick the coin. I want to use the variable statement ‘whatever the second largest coin is’ and allow hodlbot to fill in the blank when making a purchase. One advantage this feature would give is that it would allow me to make a specific kind of bet which I can’t make effectively using the existing options on the table. The bet I’m interested in making is that when the crypto market grows, BTC dominance will decrease and altcoins will gain disproportionately. That bet is better made by weighing each coin in the top 10 equally, or even over-weighting altcoins vs top coins, rather than weighing the top coins more heavily as the HODL indexes do. Advanced asset trading orders like options, stop loss, and the ability to purchase with margin. Some way to have a bank recognize hodlbot holdings as collateral for loans. I am holding some money in a 401k because the bank will recognize this as collateral to back a home loan. Coinloan.io, nexo.io, and their competitors are working in this space.